Available in a wide choice of leather colours, fabrics or provide your own. The Sherwood Leather Wing Back Chair is one of our most popular models. From the accent of the Queen Anne Wing Back Chair legs to the fine detail of the buttoning, the Sherwood will make a great addition to your home or office. 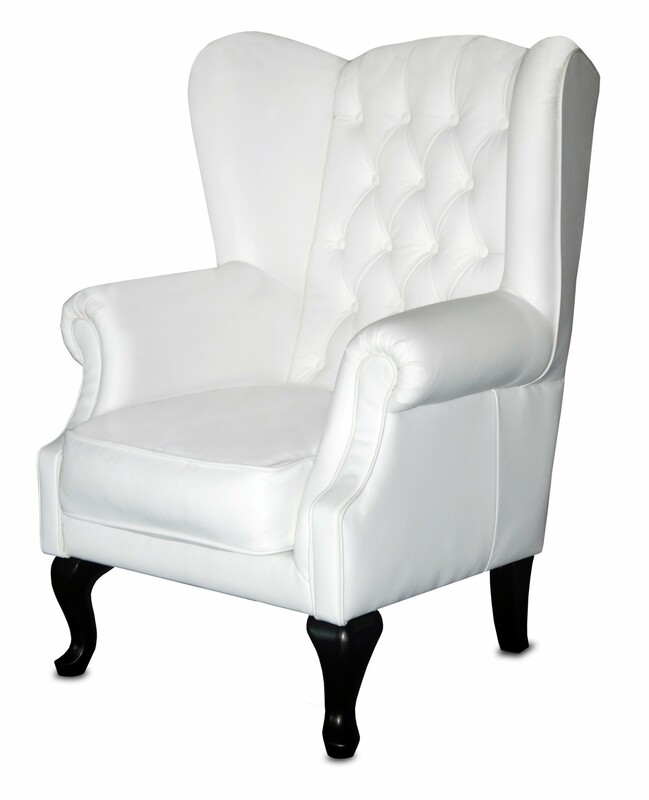 The image is of a White Wing Back Chair, but it is also available in a full range of leather colours. You could be a little funky and have your Sherwood made as a Black and White Wing Chair. Queen Anne styling is a perfect complement to Chesterfield Furniture. While the traditional Queen Anne styled furniture was a little smaller than modern day incarnations of this style the endearing feature of the classic Queen Anne or Cabriole leg is very common on all our chesterfield wing chairs. Curved lines in the back, seat and arms are characteristic of this style of furniture. While not everybody's favourite there are many devoted lovers of this style. You can modernise your wing chair with many choices of leather from our selection. The huge range at Warwick Fabrics is also available for you to choose from. There is the opportunity to create your own special accent chair. You can choose the cover rather than having to choose what is available form other retailers. When looking at creating a modern piece of furniture for your home many customers will automatically go for the White Wing Chair. All our range of chesterfield sofas, chairs and beds are available in white leather (or fabric). This is a great way to really make a statement in your room. If you don't like the traditional look for the Wing Chair in oxbloo, brown or green, modernise it with a full splash of white leather. It is sure to be a conversation stopper next time you have visitors. A White Wing Back Chair is great, but you may want another colour. There are many options at the Chesterfield Gallery for you to add your own individual touch to your room. Whilke it is always nice to have a large chair, sometimes it just is not possible. being a little more compact, the Sherwood is a great example of a small wing back chair that still embody the vintage look and feel of these chairs. This beautiful, traditional Wing Chair is available in your choice of leather. Its construction of a combination of New Zealand Pine, hardwood and plywood frameand is backed up by a 10 year warranty on the frame. The seat is fully sprung with non-sag springs in the base and pocket springs in the cushions ensuring long life and comfort. This classic chesterfield is available in a wide range of colours. At Chesterfield Lounges you can get your new Wing Chair upholstered in either our wide range of leather or choose from 1000's of fabric choices from Warwick Fabrics. You can also provide your own fabric. If you are looking for Wing Chairs in Brisbane, Sydney, Melbourne or anywhere else in Australia, call us for a freight quote, it is cheaper than you would expect.